When you are booking a room and want to include a package, we are here to make your stay with us a memorable one. Indulge yourself and/or your partner and celebrate a special occasion, anniversary, a proposal, birthday or romantic getaway with one of our packages or add-ons for a lifetime of memories. If you want to design your own special package you can add any of the items listed at the bottom of this section. We can host your bridal shower or baby shower or host a tea for you and your friends/family. If you don’t see something listed that you would like, let us know and we will try to get for you. Note: The prices for packages and/or add-ons do not include state and local taxes and will be added to the prices listed. Packages and/or add-ons must be purchased at least 48 hours in advance. Only sparkling wine that comes from the Champagne region in France can be called Champagne. If it comes from any other location it is sparkling wine. Did you forget that special occasion (birthday or anniversary)? Need to correct this oversight fast? Call us and we can arrange a memorable evening(s) that makes it look like you have been planning it for weeks. A fresh flower arrangement and a card from you will be waiting in your room. A bottle of chilled Prosecco or a bottle of wine. A cheese, fruit and crackers tray. Dinner arrangements have been taken care of ($50, $75 or $100 gift certificates) to an area restaurant are available. Retire to your room, with turn down service and chocolates on your pillow. The following morning you will enjoy our legendary breakfast. Price includes a room in the mansion, Prosecco, cheese, fruit and crackers, flowers and a $50.00 gift certificate at a local restaurant (can be upgraded to a higher amount) and of course our legendary breakfast. Kick it up a notch; we can arrange a limousine to take you to dinner and/or add a massage in our on-site massage and body works studio to complete the package at an additional fee. Add an additional night to keep the magic going for $199, in the mansion. 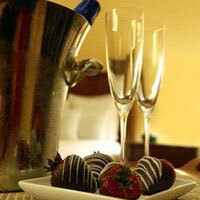 Have a bottle of chilled champagne waiting in your room after dinner for an additional $50.00. A playful in-room extra for weddings, anniversaries, second honeymoons or any couple in the mood for fun. A bottle of wine or Prosecco. Inspiring basket of bath products. One night stay in the mansion. Add a second night for $199.00. Two nights in one of our luxurious rooms in the mansion. Welcome Refreshments for arrivals between 4-5PM. Experience dining in one of our area restaurants each evening ($50.00 gift certificate for each evening). Turn down service is provided each evening. Our legendary gourmet breakfast each morning. Add on: Add a massage in our on-site massage and body works studio to complete the weekend. Relax and renew with a three night, four day escape. Be pampered and see the sights of Central Virginia during your stay at The Carriage House Inn Bed and Breakfast. You will be greeted each afternoon with wine and cheese from one of our local wineries. One afternoon a chauffeured limousine will pick you up and whisk you away to visit one of our local wineries for a three hour tour. Each evening you will enjoy dinner for two sampling several different restaurants in downtown Lynchburg (Three $75.00 gift certificates). Each night you will receive turn down service with chocolates and each morning you will enjoy our legendary breakfast. Finally, to complete the experience you will receive a total of two one hour Swedish massages (can be two massages for one person or one massage each for two people). Massage treatment can be upgraded by paying the price differential. A $50.00 gift certificate to one of Lynchburg’s downtown restaurants is also included in this package (The amount can be increased at your discretion). One LaStone Massage in our on-site massage studio. When you return your bed will have been turned down and chocolates will be left for you. The next morning you and will enjoy our legendary breakfast. Add-on: Return from dinner and have up to 10 of your friends “here” to surprise the guest of honor. Snacks and drinks (non-alcoholic) will be served. Includes use of event center for 1 1/2 hours, food and clean-up. Add $250.00 Party must conclude by 9:00pm in respect of our other guests. Leave the husbands/boyfriends behind and reconnect with your girlfriends from college, work, and church or sports team and have a fun filled relaxing weekend. Tour the local wineries, visit antique shops, have a massage or other body treatment in our on-site massage and body works studio, curl up with a good book or watch a movie. You won’t have to clean up after your husband, fix dinner for the kids or do laundry or housework; this is your weekend to be pampered and attended to or just relax. Sleep in or get up early for a jog on our one of the many paths, just blocks from our Bed and Breakfast. Each evening you will receive turn down service with a chocolate. Enjoy our legendary breakfast each morning. Let us know what you want to do and we will set it up for you. Price is based on double occupancy and the room selected. Weekday rates slightly lower. Discount is given if all rooms are booked. Requires a minimum of two nights. See below for any add-ons to make this a memorable weekend. One of our fabulous rooms for two nights, in the mansion. Before dinner a bottle of wine accompanied by cheese, fruit and crackers will be delivered to your room. The following day, you will be whisked away in a limousine to tour one of our area’s premier wineries (includes 3 1/2 hour trip with the limo and driver). Of course our legendary 4-course breakfast is provided each morning of your stay. Each fall the local vineyards start harvesting grapes for the next batch of wine. This process is done by hand and many of the local wineries rely on volunteer grape pickers. If you are interested in participating (typically late August-October) let us know and we will put you in touch with a vineyard. Unfortunately these dates cannot be scheduled months in advance. Harvesting dates are dictated by many factors, especially weather so we may only get, at most, a week’s notice. Reservations for your stay can be booked at The Carriage House Inn Bed and Breakfast. Let us know if you would be available during the week or just on weekends. The wineries we work with are within a 30-45 minute drive. If you have a preference of wineries let us know and we will try to accommodate your request. The above cost is for the cost of accommodations at The Carriage House Inn Bed and Breakfast. We offer special rates for weddings/conferences/reunions/girls weekend, etc. When reserving all 6 guest rooms with a maximum number of 16 guests rates start at $1,100.00 per day with a two day minimum. Additional facility and rental charges will be added to hold events on site. Our legendary breakfast is included each morning. We offer catering services (additional charge) for other food options. Just let us know what you are looking for and we can make it happen. Check our add-ons at the bottom of this section. Want to bring in the New Year with that special person? Don’t want to be on the road with all the other crazy party goers on New Year’s Eve? Book your room, arrange an early arrival or check-in (between 2-4 pm), enjoy dinner at one of our downtown restaurants ($75.00 gift certificate), return to our decorated mansion to enjoy the evening with that special person(s) and toast the New Year with Prosecco. Sleep in and enjoy our gourmet brunch on New Year’s Day. Take advantage of our late check out (1:00pm) so you don’t feel rushed. Let us host your next tea. Whether it’s for a group of friends, or as a bridal shower or baby shower we can take care of all the details. Price includes a facility use charge of $300.00 (for up to 3 hours) plus a per person charge starting at $15.00 per person with a minimum of $150.00 for up to 10 guests for the basic tea. Make it as fancy as you wish. Don’t need a package but want to add a little more to your stay? Pick from our ala-cart menu. We require a minimum of 72 hours notice so that we can make sure we have your extras on hand upon your arrival. Prices do not include state and/or local taxes.